This item caught my eye. I only wish they hadn't made it into a candle stick! 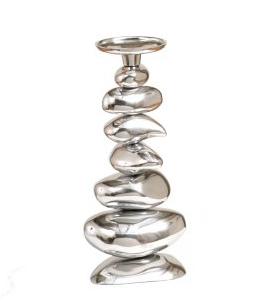 I would love to see the stack of pebble forms finished in the highly polished aluminum just as a sculpture unto itself. It gives me ideas for things to do with some of my stone towers. How about gloss black spray paint for a very different yet possibly striking effect. Worth some experimenting this summer!